If there’s one thing I love it’s a good fad website, and the latest in a long line of quality picture sites is There, I Fixed It. 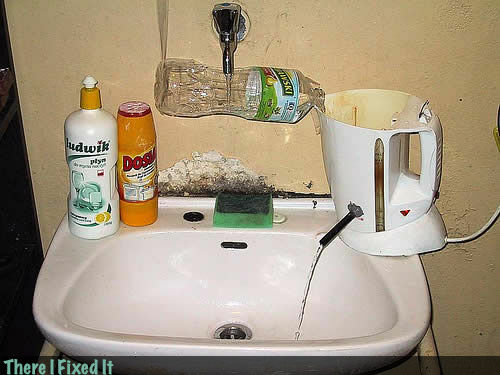 There, I Fixed It highlights the best of creative engineering solutions to problems we might face every day. Like, for example, the hot water heater fix you see above. There are no captions or cute animals, but you don’t need them when you’ve got Rube Goldberg inventions around! Is most of the stuff featured on the site horribly unsightly, and possibly very unsafe? Yes, so DO NOT try this at home. Unless you’re like my dad, in which case you do this stuff all the time and have thus far been exceedingly lucky and/or good at what you’re doing. Among the projects my dad has undertaken lately, the most TIFI-style work was done when he rewired the water spigot in the door of our refrigerator to bypass the filter system (thereby saving the expense of new filters every 6 months). It works like a charm, and since we have good-tasting water locally, the filter wasn’t really necessary. Unfortunately, it didn’t require any crazy feats of engineering, either, unlike the crack in the wall he patched with a series of concrete screws, caulk, and a big piece of plastic flooring.